Conveniently located in Cleves, Ohio, the Dental Depot sits at the intersection of River Road (U.S. Route 50) and Bridgetown Rd. Patients from southwestern Ohio, Cincinnati, southeastern Indiana and northern Kentucky seek out the Dental Depot for its top-of-the-line dental treatment, comfortable family atmosphere, and dedicated and caring team. 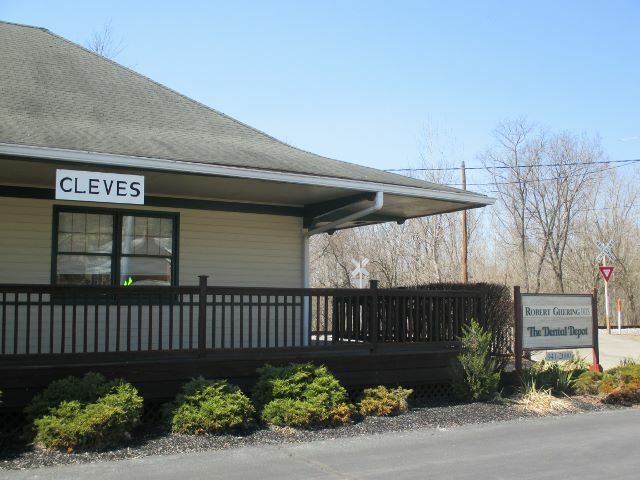 The Cleves Depot has been a landmark in the community since the late 1800s. history of the Dental Depot. We do not want finances to be an obstacle in attaining the beautiful smile you desire. We offer several flexible financing options - remember that a healthy smile can be a small investment with a big return! Our office is committed to providing you with the best possible care. It is customary that payment is due on the day services are rendered. You will be given an estimate of your costs. Please ask if you have any questions concerning the costs involved in your care. In addition to the payment options listed above, many dental insurance plans are accepted at the Dental Depot.